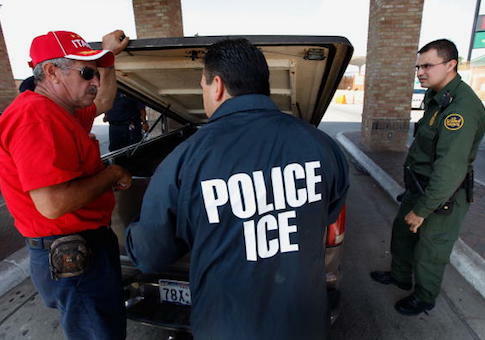 A story about immigration officials detaining a man who was driving his pregnant wife to the hospital went viral over the weekend, receiving immediate rebuke from critics of Immigration and Customs Enforcement, but ICE later revealed the man was wanted for murder. Los Angeles CBS affiliate KCAL 9 reported Friday that Maria del Carmen Venegas' husband was driving her to the hospital for a scheduled cesarean section when their car was swarmed by ICE agents in a pair of SUVs. Her husband Joel Arrona-Lara was taken into custody, leaving Venegas to drive herself to hospital. The story went viral, earning widespread coverage in the national media and outrage from liberal reporters. ICE detained a man while he was driving his pregnant wife to the hospital. He was taken when they stopped for gas. "A new baby boy is without a dad today," is how CNN reported on the story. "ICE agents hauled him away, the father, as the family was headed to the hospital where the mother was scheduled for c-section." But after the story went viral, ICE clarified that Arrona-Lara was arrested on suspicion of murder. "Mr. Arrona-Lara, a citizen of Mexico illegally residing in the United States, was taken into custody Wednesday by ICE Fugitive Operations Team officers in San Bernardino, Calif…" ICE said in a Saturday statement. "Mr. Arrona-Lara was brought to ICE’s attention due to an outstanding warrant issued for his arrest in Mexico on homicide charges." Arrona-Lara's lawyer denied he faces any criminal charges in Mexico, and said that in any case the agents had a responsibility to call an ambulance to take the pregnant woman to the hospital. While media outlets updated their stories, many of their initial tweets remain up without the important context. This entry was posted in Politics and tagged ICE. Bookmark the permalink.